The new, state-of-the-art multipurpose Bentley Arena is the most environmentally sustainable in the U.S. and the first standalone ice arena to earn the LEED platinum certification, the highest possible rating, according to the U.S. Green Building Council. 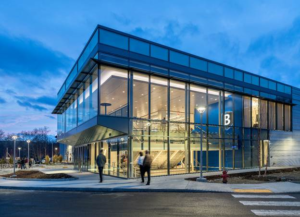 The award for the recently opened, 76,000-square-foot arena highlights the building’s sustainable design and energy efficiency and Bentley University’s continued rise as an innovative, nationally-recognized business university. ● A 504 kilowatt, rooftop solar array developed by Rivermoor Energy that will generate 40 percent of the building’s annual electricity needs. ● Innovative technology that captures heat generated from the rink’s ice-making equipment to heat water throughout the building. ● More glass windows than a typical arena, allowing for more natural light that decreases the amount of electricity needed to light the building’s interior. ● High-efficiency LED lighting with smart, motion-detecting controls that turn off lights when no one is present to sharply reduce electricity usage. ● Ice-making and air conditioning systems that use zero CFC-based refrigerants. Chlorofluorocarbons or “CFCs” have been found to destroy the planet’s stratospheric ozone layer. ● The highest-efficiency plumbing fixtures on the market, including waterless urinals, dual-flush toilets, and low-flow faucets and showers to reduce the demand for water. ● At least 50% of wood used in the building is sourced from forests with certified sustainable forestry practices. ● About 10% of construction and finish materials were locally sourced and about 20% of construction and finish materials contain recycled content.